Whenever projects require components which are identical or mirror images of each other, the use of well designed templates and jigs will make the processes involved safer and more accurate. 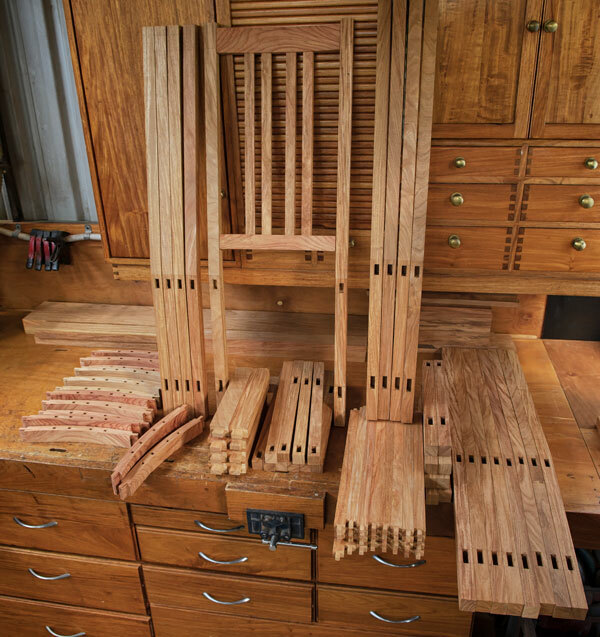 There are many pieces of furniture that require making the same thing over and over; chair legs, curved back rests and in the case of my shoe rack (see photo 9), four legs with compound curves. If each leg was even slightly different from the others the rest of the joinery would become a nightmare to complete. This would apply equally to any other project where components must look identical and allow batch manufacturing. 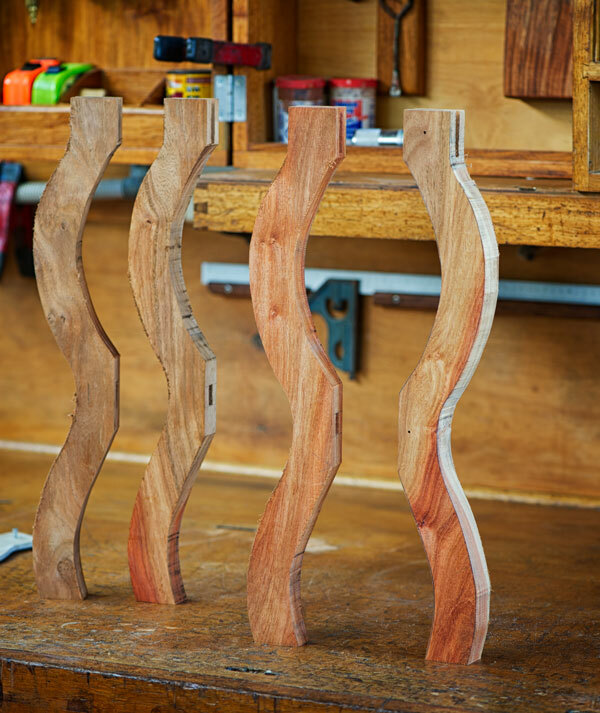 There are times when freeform ‘do it by eye’ woodworking is what we’re aiming for. This article, however, will focus on the times when making things look the same for both form and function is the goal. Once a design has been finalised, the time comes to work out how to go about actually making components, and this is where plywood templates come into their own. By making a full scale silhouette template of the component first, any design flaws come out immediately, and changes can be made before any valuable timber is committed to the saw. Photo 1 above shows my plywood template in the process of being made. The outline of the leg is marked, as is where I expect the mortises to go and two small holes where I intend to put attachment screws through the plywood and into the timber. Where to put these holes takes a lot of thought. I don’t want to leave obvious holes in my components when they are finished, yet for safety reasons want to make sure the template is securely fastened to the timber. Further, I don’t want screws anywhere near the edge of the component where the router bit might hit. In this case, I’ve put the screws out of the way in the middle of the mortise joint. That way I can make use of the hole (when everything else is finished) to put a securing peg through the joint and no one will ever know the screws went there in the first place. Photo 2 now shows the template screwed to the workpiece. Note how the template and leg are exactly the same length and the width of the timber exactly matches the maximum width of the template. No additional attachment is needed as the template will be removed and reattached several times during the process. While it is attached it is a good time to put a heavy pencil line along the sections that will be bandsawn away. Now that the shape has been drawn on to the timber any mortises or other joinery are completed before I lose all my square sides. This is the value of marking out where these joints are to go on the template itself. It follows that if you use the template to mark out exactly where the edges of the joint are to go, each leg will have the mortise (in this case) in exactly the same place. 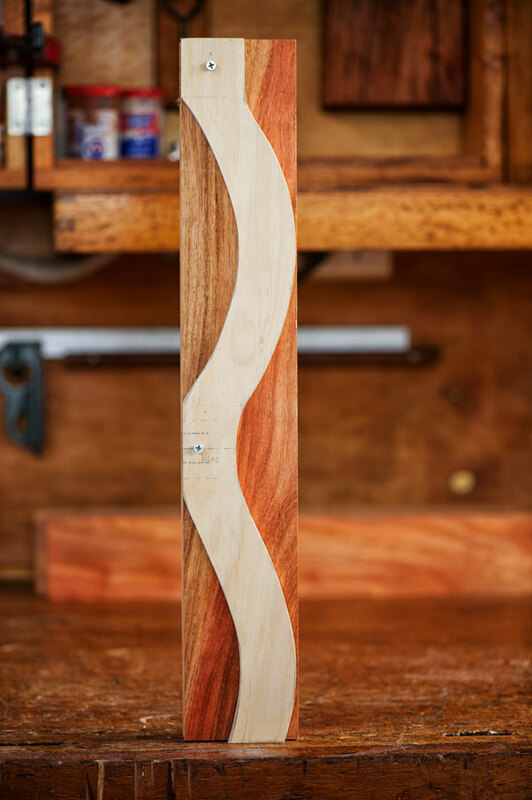 This can also be done by careful measurement, but putting two tiny notches on the side of the template and transferring it directly to the timber increases accuracy and consistency. Photo 3 shows how carefully I follow the pencil lines drawn onto the timber. 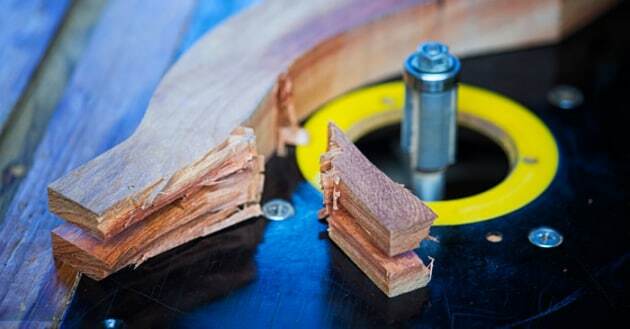 This is because a flush cut router bit is safest when it is shaving off a minimal amount of timber. The more waste you leave at this stage the riskier it makes the trimming later. The trick is, never cut inside the line. Doing that is much worse than leaving a little too much waste because you’ll likely ruin the component. The flush cut bit can take waste off, but nothing I know of can put it back on. Photo 4 shows the four legs made using the one template. Notice the mortises in the middle of the legs are all in place as are the bridle joints at the top. These legs already look identical and if you wanted to go for a more rustic ‘handmade’ appearance you could now take out the spokeshave and round the legs over. Here, however, I wanted the legs to be as identical as possible so took them to the next stage. Photo 5 shows the template screwed back on to the blank and the top bearing flush cutting router sitting in relation to the plywood. The bearing on the cutter will push on to the plywood and in the process skim away any excess timber left on the leg blank. Please note: this is not how I would go about skimming off the timber. This photo was taken to show how the bearing bit works and for clarity only. Using your fingers to hold on to the template while you push it along the spinning router bit is a dangerous practice. A safety jig should be used because that bit is spinning at colossal speed. If your fingers slip off the template or come anywhere near that blade the damage to your fingers or hand will be instant. Photo 6 My concerns over safety were vindicated, as shown. The template has been taken off to show what happened. 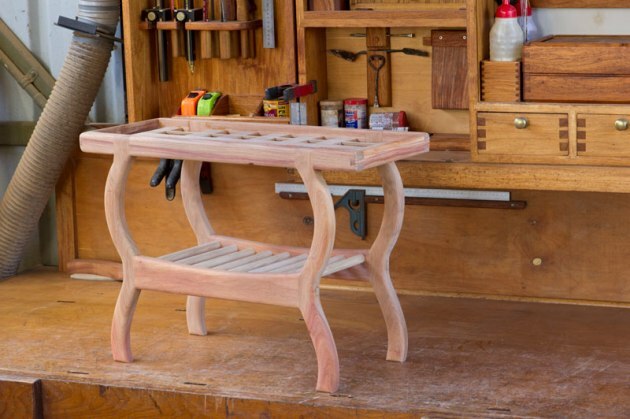 There must have been a tiny flaw in the timber, or the router bit has bitten into the end – I don’t know which – but there was a bang in the workshop, a piece of the leg came out and an ashen-faced student was left holding the safety jig. The jig protected fingers and hands and was also heavy enough to prevent the whole assembly from being flung across the workshop. Photos 7, 8 Two views of the safety jig. It has two toggle clamps which push down on any template I want to use and so sandwich the template / blank assembly on to the jig. The jig has a convex and a concave side to accommodate both types of curve. 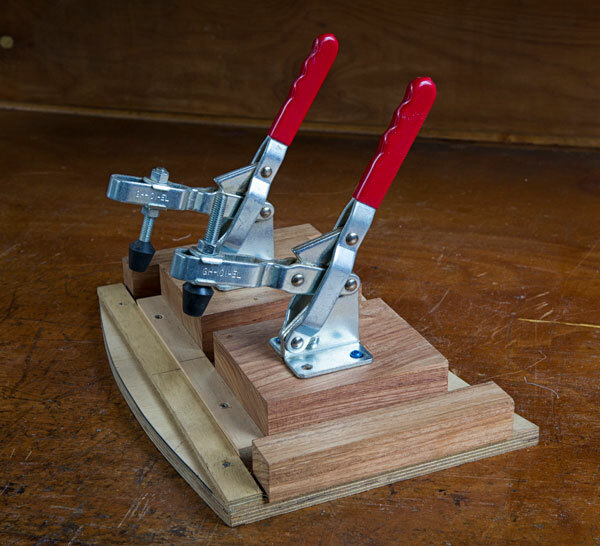 To use the jig, clamp the toggles down and hang on to the thick blocks of timber supporting the toggle clamps while pushing the edge of the template along the router bit bearing. Hands and fingers are well away from the router and there is a mass of hardwood separating the two. Using the safety jig will require the router bit height to be adjusted accordingly so the bearing makes good contact with the template. The height should ideally be set so the bearing contacts the plywood such that the bottom of the bearing sits about half a millimetre below the ply. timber and throw the assembly up into the air. If this particular jig doesn’t fit, I mess around making one that will. It doesn’t take all that long and the safety benefits, while maybe never realised, are great for peace of mind and a confidence boost to the user. Photo 9 shows the completed shoe rack that the components machined on the jigs shown were made for. Designing and making up jigs like these is time well spent. 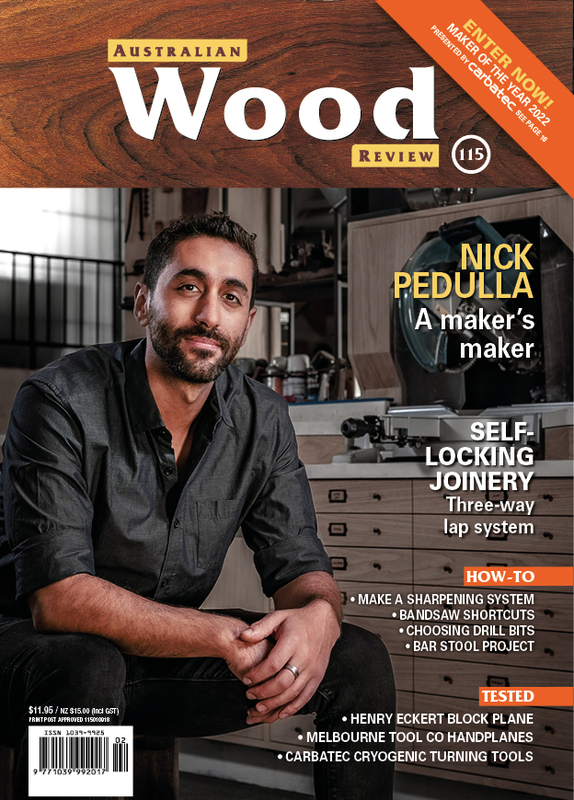 Your woodworking life will be safer and you’ll get better results. John Kennedy lives in Cairns, Qld. His philosophy is that if someone goes out into a forest and kills a tree on his behalf it’s then his responsibility to turn that timber into something that will last at least 50 years to give nature a chance to replace what was taken.